Makerspaces, sometimes referred to as maker culture, creation labs, hackerspaces and fablabs are creative, DIY spaces where patrons can gather to create, invent, and learn. These spaces have changed the view of libraries from spaces for consumption to spaces for creation. Libraries now provide resources such as 3D printers, Espresso machines, software, electronics, handicraft and hardware supplies and tools to Makers in Residence to assist them in developing their innovations. Have the potential to demystify science, math, technology, and engineering; and encourage women and under­represented minorities to seek careers in those fields. They also tie in to the growing trend of indie/ independent artists in every medium—including books—who are bypassing traditional gatekeepers, taking advantage of new tools to produce professionally polished products, and going direct to the web to seek an audience. iLibrarian Elyssa Kroski does yeoman service by offering resources for librarians wishing to create makerspaces at their libraries under the headings Articles & Blog Posts, Events and Makerspace Directories. 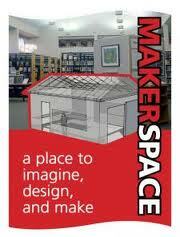 The makerspace movement is gaining momentum in the library world. In his recent report on “Libraries and the informational future: some notes,” Lorcan Dempsey of OCLC noted how “space is being reconfigured around broader education and research needs, and less around the management of print collection. In effect, space is shifting from infrastructure to engagement…” Nothing represents this emerging trend more than the recent growth of makerspaces within libraries. An online and mobile map of makerspaces in museums, retail outlets, etc. Why aren’t Libraries a category in this application? Perhaps not enough of them are listed as having makerspaces! Libraries offering this type of DIY space will want to list themselves here. This is a directory of events and listing of all active hackerspaces throughout the world as well as a source of information and resources. This is a directory of makerspaces as well as a community and source of information and teacher resources. your posts more, "pop"! Your content is excellent but with pics and video clips, this site could undeniably be one of the most beneficial in its niche. paragraph i am as well delighted to share my familiarity here with colleagues. This Brighton accessories and handbags has a new top slant. stamps. Probably the main reason is to save money, basic. https://podcast. replica gucci bags?? He has also designed his rather own like of cabinets and home decorations. Thanks for the explanation of the DIY movement and the Makerspace. I was very curious to learn more about what it was and now that I know more about it I find the concept very interesting. This would be a great benefit to patrons once it is marketed properly!